Do you spin yarn, felt, knit or crochet with alpaca? Grab these totally FREE printable tags or labels for your handmade alpaca fiber items! Printable tags especially for those who spin, felt, knit or crochet with alpaca fibers! These "Hand Made 100% Alpaca" tags will look fabulous hanging on your hand crafted gifts or craft show items. Simply click on the link below to download the printable tags file for your personal use. I hope you like these free printable tags and find them useful. Please remember these are for personal use to print and label your own handmade alpaca wool items for gifts or for sale. These are not for resale in digital or print form or any other form for profit. If you have questions about their use, don't hesitate to contact me. Thanks a bunch! If you share these tags through Pinterest, Facebook, Twitter or other social media (and I sincerely hope you do!! ), please be sure to link directly to this blog post and not the free file itself - just one small way you can help this independent blogger and crafter. 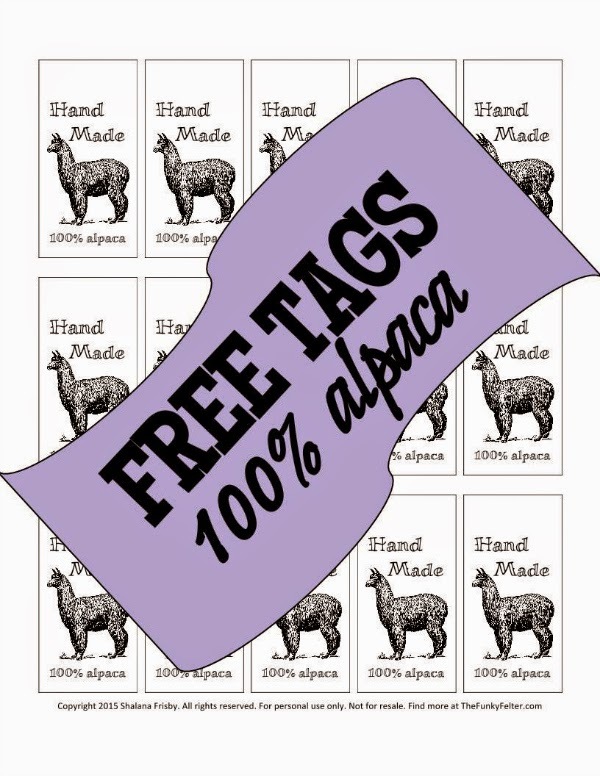 CLICK HERE to download & print the funky felter's free "Hand Made 100% Alpaca" tags. Psssst...if you like these tags, I have more free tag designs coming up in future posts! Don't miss out on all the great freebies for fiber crafters! CLICK HERE to subscribe to my weekly email updates. And, please share this freebie with your fiber lovin' friends! Want more tag and label choices for your fiber crafts? Find many more professional and inexpensive designs in my ETSY SHOP. Copyright 2015 Shalana Frisby. All rights reserved. For personal use only.